The Polynesian Resort’s Kona Cafe is a little more “cafe-like” in the the morning for some reason. Maybe it’s just the morning light. Kona Cafe is actually a table-service restaurant located on the second floor of the Polynesian (on the same level that the monorails are on), and like a cafe, it can get loud at times (perhaps because half of the location is open to the adjacent lobby walkway). 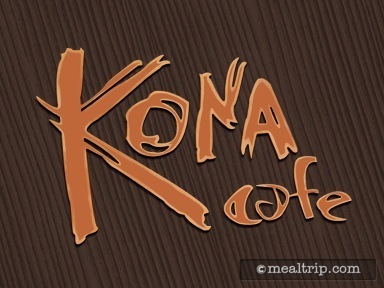 The Kona Cafe is on many guest’s must-do list for breakfast because of a few items that have grown to “legendary” status. One of those items would be the “Tonga Toast” which is a Banana-stuffed Sourdough French Toast rolled in Cinnamon and Sugar. The Macadamia-Pineapple Pancakes also draw quite a bit of interest.